Design Inc are leading venue website design specialists and we are pleased to announce the ‘go live’ of the next generation website we have designed on behalf of One Great George Street (OGGS), one of our longstanding venue website design clients. OGGS is a unique award winning Westminster venue that, with our marketing and website design support over the last 5 years has consistently punched above its weight in terms of market share event earnings, reputation and destination status. The new venue website design has been six months in the making and takes OGGS online presence to a new level. The new venue website has been created with a totally intuitive UX journey and experience, it is a functionally rich resource with logical navigation and useful interactive tools, which includes a powerful room guide schematic, showcasing spaces and connectivity. 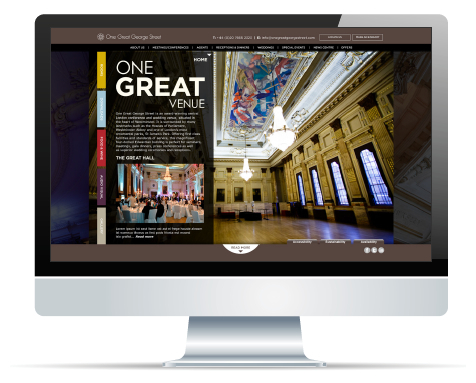 The new venue website incorporates fresh brand imagery and accessible tone of voice and the result is a powerful venue website design that demonstrates the full event potential of the One Great George Street to venue and event bookers. The site is also fully responsive to screen formats and optimised for users browsing from tablets and smart phones. According to Design Inc Director, Frank Norman, ‘ The venue website design for One Great George Street has progressed smoothly through planning, design and programming stages. The new site will ensure that OGGS remains at the front of mind for venue bookers looking to hire this landmark period space in Westminster. According to Anna Glazebrook, OGGS’ Marketing Manager, Working with Design Incorporated, who know our brand inside out (having built many of our assets over the past five years) on this major digital undertaking was great as Darren and his team of designers and project managers worked very collaboratively with us – bringing creativity and discipline together and ultimately delivered totally on promise. One great venue website design!